The weekly winning streak for U.S. stock finally came to an end in the final full week of March. 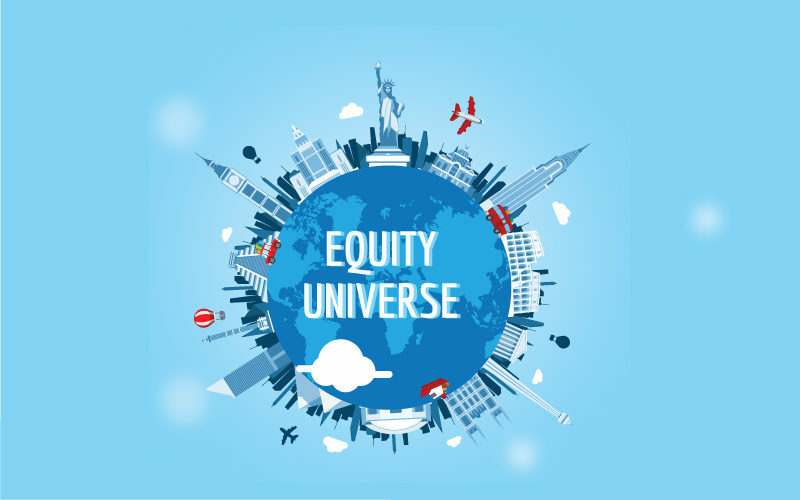 Not much news this week to drive equity prices. The fall in equity prices this week was simply due to the trading algos which pushed key indexes to major resistance levels, then reversed into sell programs once reached. The daily chart of the S&P 500 clearly shows the V-shaped recovery off December lows targeting the November highs. In Europe, the European Central Bank slashed its growth forecast for 2019 to 1.1 percent from an earlier forecast of 1.7 percent made in December. ECB President Mario Draghi said Thursday that there had been a “sizable moderation in economic expansion that will extend into the current year.” He added that the “persistence of uncertainties related to geopolitical factors, the threat of protectionism and vulnerabilities in emerging markets appears to be leaving marks on economic sentiment”. The EUR/USD has been in a downtrend since last March (U.S. dollar strengthening). This is another example of news following the markets. Macro data this week look fine, belying the weak performance in equities. New-home sales ran at a seasonally adjusted annual 621,000 rate in December, up +3.7% from November but -2.4% lower than a year ago. 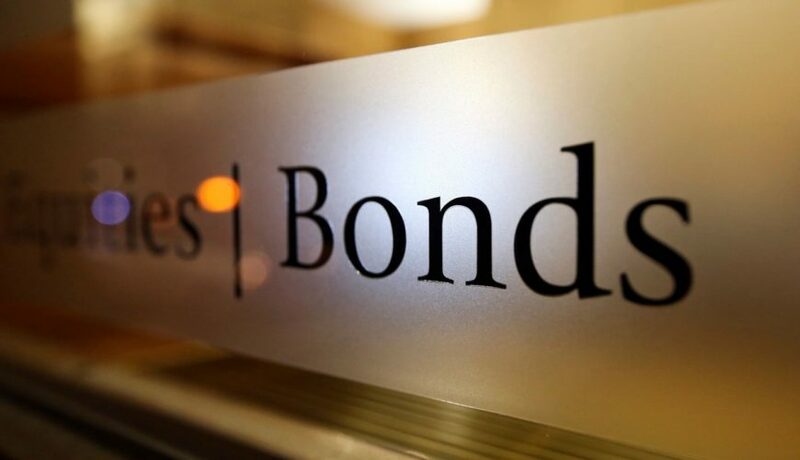 The number beat the consensus for a 600,000 rate, although prior months were revised down. The median sales price in December was $318,600, 7% lower than a year ago. 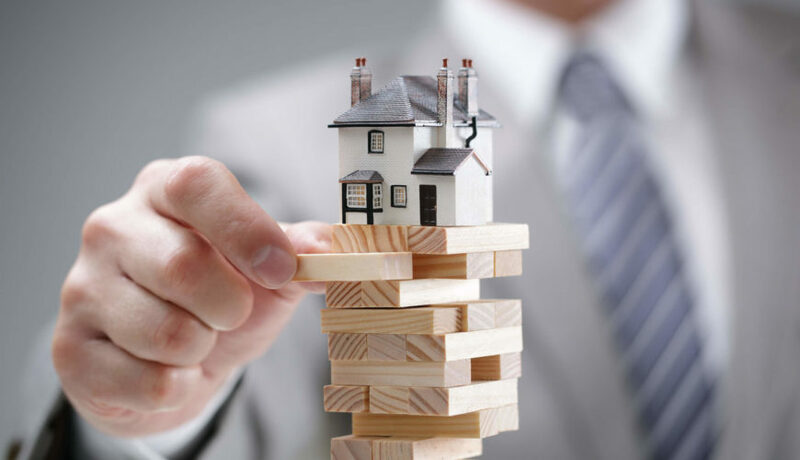 At the current pace of selling, it would take 6.6 months to exhaust available supply, a bit more inventory than is generally considered a marker of a balanced market. 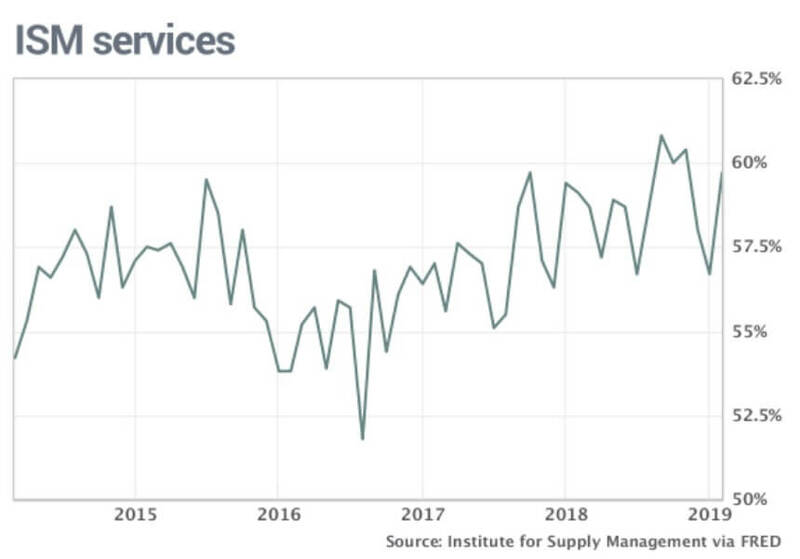 Companies on the service side of the economy that employ the vast majority of American workers grew in February at the fastest pace in three months, with the ISM Non-Manufacturing Index up to 59.7 in February from 56.7 in January. This is the first sign that U.S. growth might be picking up after an earlyyear lull. The strength on the service side of the economy stood in contrast to softer growth in manufacturing. Last week, ISM’s manufacturing survey fell in February to the lowest level since Donald Trump was elected in November 2016. The U.S. trade deficit shot to a 10-year high in 2018 despite frenzied efforts by the Trump White House to reduce the gap. The deficit jumped nearly 19% in December to a seasonally adjusted $59.8 billion. That’s the single biggest monthly gap since October 2008. 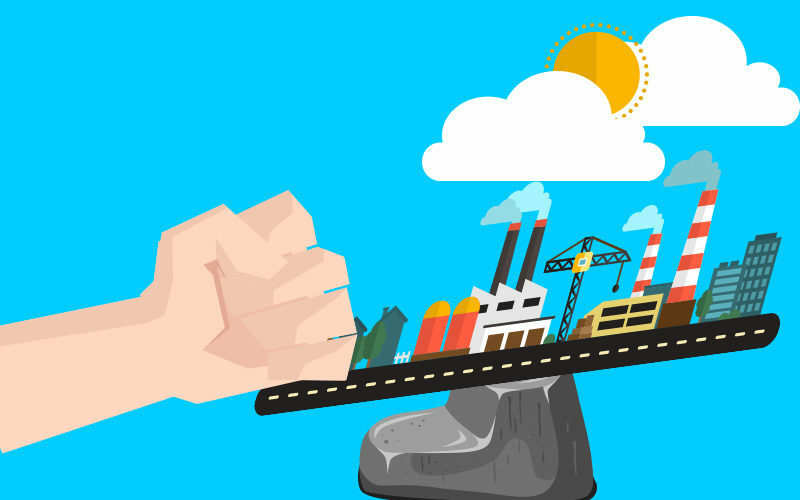 The trade gap mostly reflects U.S. economic strength relative to major trade partners like China. U.S. productivity advanced at an annual pace of +1.9% in the final three months of 2018, up slightly from a revised 1.8% in the third quarter of last year. The rate of productivity — the key to a higher standard of living for American families — rose 1.8% year-over-year. That’s the fastest 12-month gain since 2015. Unit-labor costs rose at a 2% clip in the fourth quarter, but just 1% in the past 12 months, suggesting little likelihood of an outbreak in inflation. Productivity has been weak for years, but lately it’s shown signs of life, perhaps because of a ramp-up in business investment in 2016 through early 2018 triggered in part by the Trump tax cuts. a sustained burst of higher business investment is needed to lift productivity, and while spending did increase in the past few years, businesses now appear to be cutting back. Ongoing trade tensions with China and a slowing global economy have made CEOs skittish. 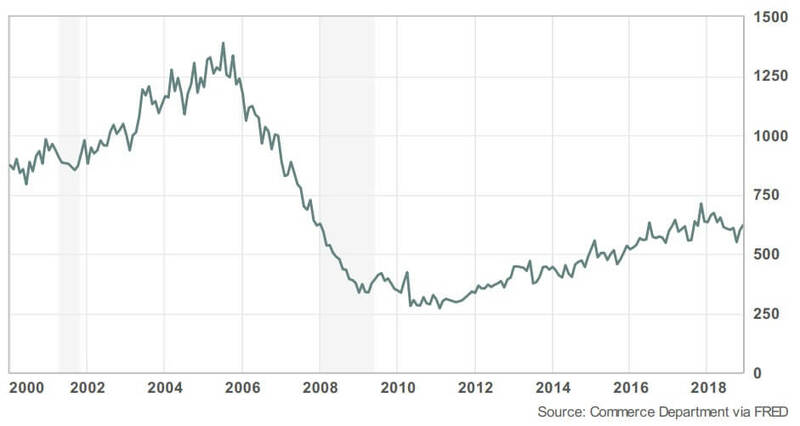 Non-Farm Payrolls and Housing data pending for Friday. 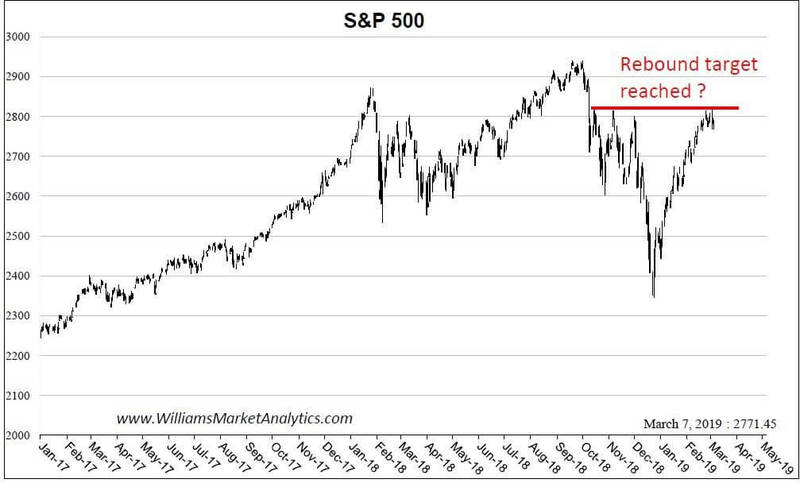 While macro-economic data is only suggesting decelerating economic growth, the real risk for stocks is an earnings recession. An earnings recession is defined as two consecutive quarters of negative y/y earnings growth. Many pundits called for an earnings recession back in September. The thesis was simple: Each of the main drivers of earnings growth over the last two years — revenue growth, margin expansion, and lower taxes — faced headwinds and difficult comparisons that would lead to a material slowing in 2019. With consensus earnings growth expectations having fallen ~50% since last fall, the market has started to come around to this view. We still think full year growth estimates are too high as 3Q/4Q estimates embed a material acceleration of growth that history says is unlikely. We expect continued downward pressure on estimates through the year and a higher volatility environment. The leading earnings indicator below is still sending a clear message — growth is due to decelerate through year end. 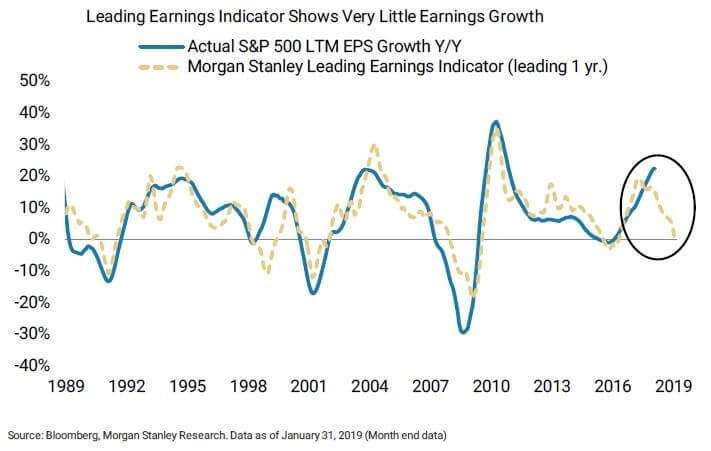 This top down model, which leads by 12 months adds to our conviction that the path for earnings growth is pointing lower for at least the next few quarters. 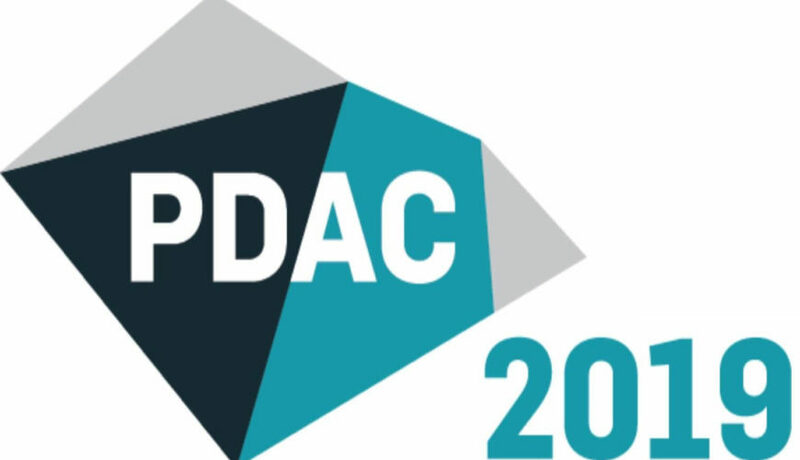 We think GDP growth is likely slowing materially in 2019 as the economy laps the boost from fiscal stimulus this year and deals with slowing business investment and personal consumption. We see real Q4/Q4 GDP growth going from 3.3% in 2018 to 1.7% in 2019. 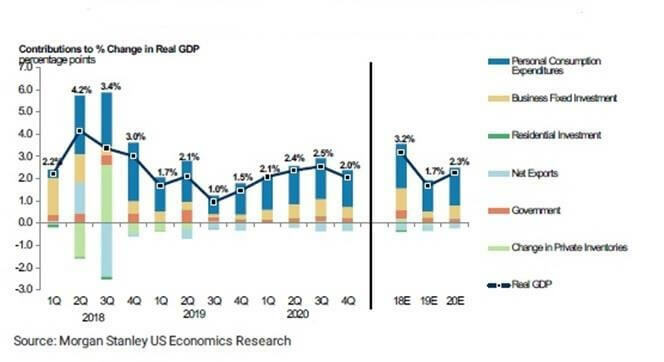 We think that this fall in real GDP growth in the US will have consequences for corporate top-line growth which is very sensitive to decelerating GDP growth. 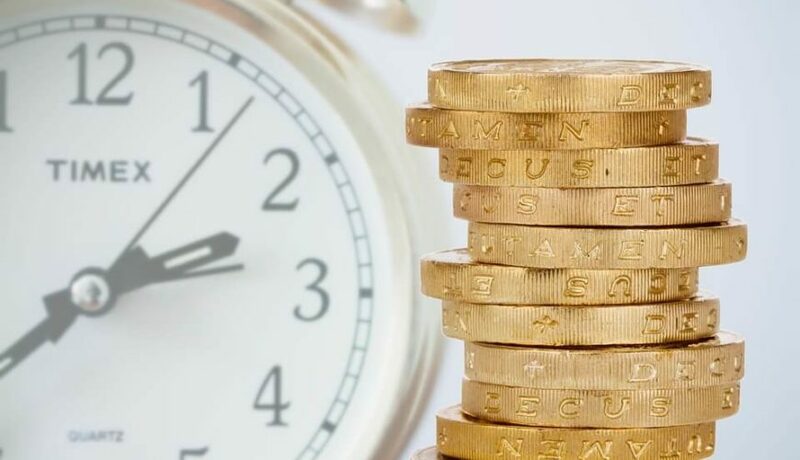 In a slowing growth environment, management teams become more apt to delay or cancel expenditures to meet their bottom-line forecasts, meaning slowing sales/revenue elsewhere. 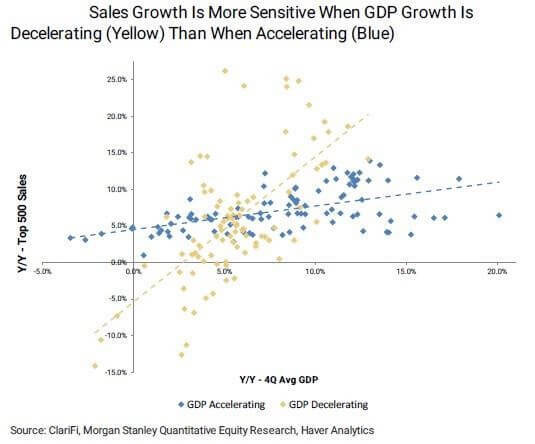 With a slowdown in GDP we expect sales growth to see a large fall from the 7%+ run rate it saw in 2018. Margin tailwinds are also set to fade. In addition to top-line missing, we expect margins to be pressured next year, removing another factor supporting earnings growth. In short, we see margin compression coming as cost pressures rise and demand slows. In the later stages of this cycle we think that rising costs — transportation/logistics, labor, funding, tariffs, materials — will begin to push back against margin expansion, especially given the already high absolute levels on S&P margins. We know from earnings calls that rising costs are increasingly becoming a focus for company management teams and we are starting to see some softness in forward margin expectations. The evidence for margin pressures is clearly mounting — 4Q18 saw EPS outgrow sales by ~6 pp, roughly in line with the contribution from tax, meaning that margin expansion has already fallen away as a contributor to growth. Will sales misses plus margins misses equal an earnings recession? The next figure shows just how sensitive operating income growth is to slowing sales growth and margins (that we think will be flat at best). The gray shaded area shows what we view as the likely range for the year. Don’t count on a 4Q19 inflection in EPS growth. Earnings growth expectations on the S&P fell from ~9% at the end of November to their current level of around 5%. 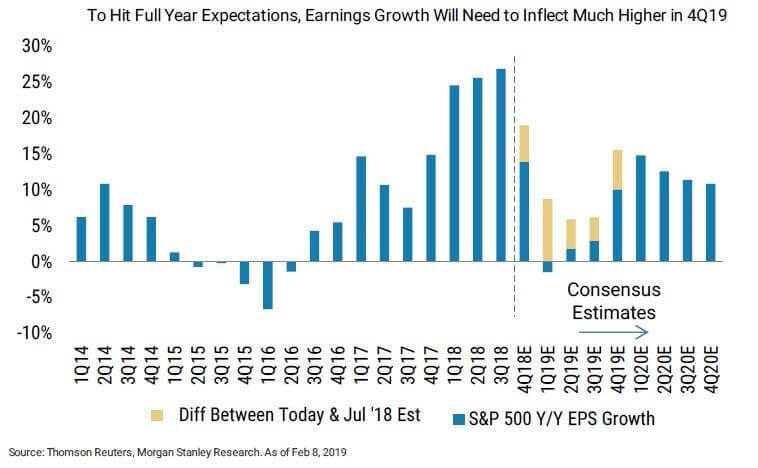 They now embed negative y/y growth in 1Q19 and very marginal growth in 2Q19 meaning the 5% full year number relies on a heavy ramp in earnings growth in the back half of the year, and in 4Q19 in particular, as shown in the next figure. Anything is possible, but we have little confidence in such an inflection given what we laid out above and the fact that management teams missed a forecast of a 1H19 slowdown. History is also clear that these types of accelerations are rare and tend to involve easy comparisons, which are not at play here. 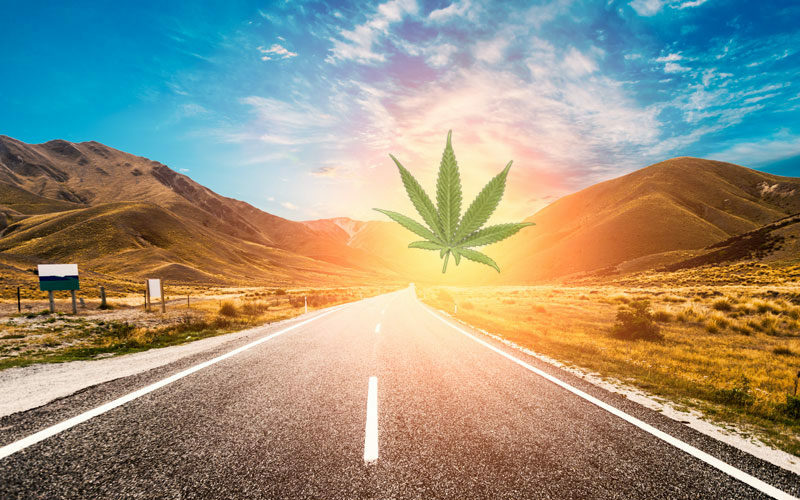 Such inflection expectations are, in fact, followed by further downward revisions, particularly to the “growthy” quarters and elevated volatility. We think that further disappointments could have real knock-on effects to corporate behavior, like spending and hiring, which then puts further pressure on growth. Lastly, valuations are at the high end of the historical range. We view valuation through the lens of rates and the equity risk premium (ERP) and, on that basis, we think a forward Price/Earnings (PE) multiple of ~16x is right. The next tables illustrate a 10Y vs. ERP matrix showing how corresponding pairs would affect the equity market PE. While these earnings numbers are below consensus, we note that a lower rate environment provides modest support for year-end target multiples. With a more dovish Fed and the majority of interest rate strategist now projecting a year end 10Y UST yield of 2.45%, this matrix highlights a target range of 15.0-16.5x forward PE for the S&P 500. This range has a diagonal tilt — on the belief that lower yields will be accompanied by higher uncertainty on growth leading to a higher ERP while higher yields may reflect a more optimistic outlook on growth, allowing for ERP compression. 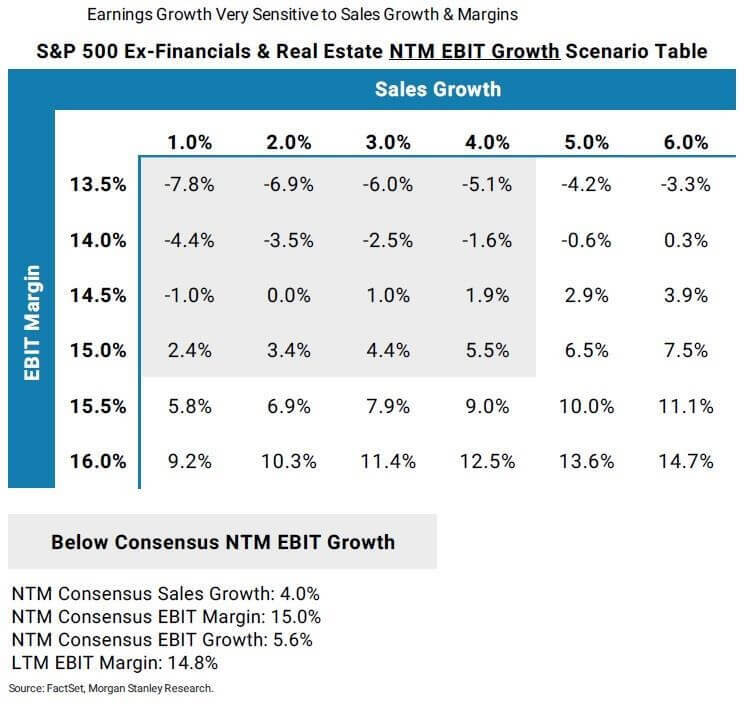 To illustrate what this valuation range means for index level prices, each box multiplies the valuation matrix by the current next twelve-month (NTM) EPS estimates from consensus, yielding a range of 2,550-2,850. Notwithstanding that we still think consensus numbers will fall, this gives a rough sense of a range on the S&P 500 that is helpful for framing risk/reward and picking entry/exit points. 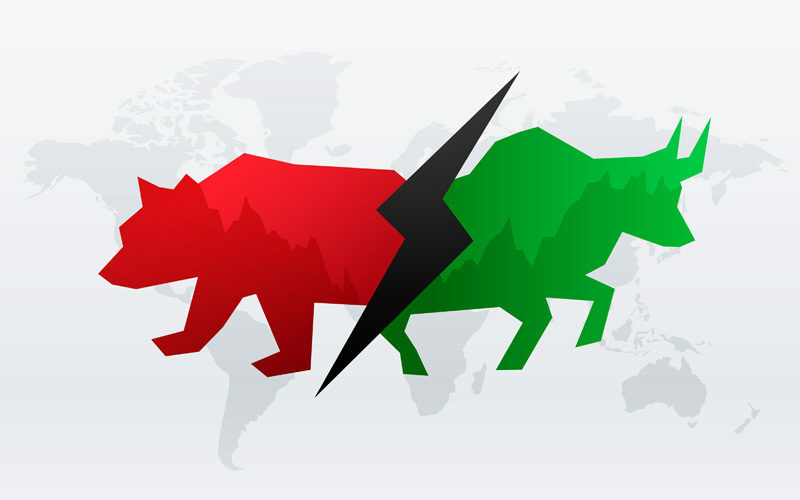 The stock market peaks well before the macro-economic begins to move to contraction. The inflection from earnings growth to earnings contraction may be the best indicator to forecast an ultimate top in equity prices.